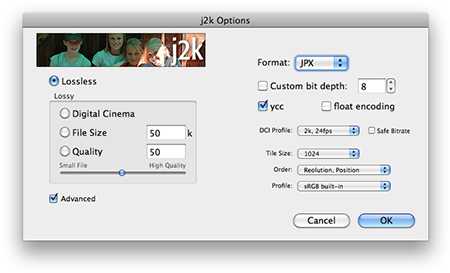 j2k is a free Photoshop and After Effects plug-in set for reading and writing the JPEG 2000 file format, the successor to JPEG. Also known as JP2, JPEG 2000 uses wavelet compression as opposed to the DCT compression used in standard JPEG. The end result is better image quality in a smaller file. JP2 also includes mandatory metadata such as information about an image's color space. The After Effects and Premiere Pro versions have the ability to Auto Proxy, meaning that when working at half or quarter resolution j2k will only need to read in a fraction of the file, resulting in dramatic speedups.